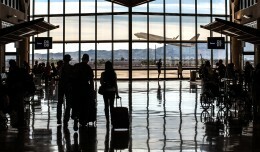 Air travel has long been the safest mode of transportation in the US, thanks in large part to the training and preparation of all those professionals involved in the industry. Airline pilots regularly practice emergency scenarios in flight simulators, working to resolve problems that may arise during flight in order to bring the aircraft safely back to Earth. Flight attendants are trained on preparing passengers for emergency landings and properly evacuating the aircraft once on the ground in a variety of challenging conditions. Airports periodically review their emergency contingency plans and conduct disaster drills to ensure that emergency response is swift and effective. While advances in modern technology as well as the lessons learned from past accidents have helped to greatly reduce the number of aircraft incidents, both those in the air and on the ground are well prepared to respond in those instances when problems do arise. 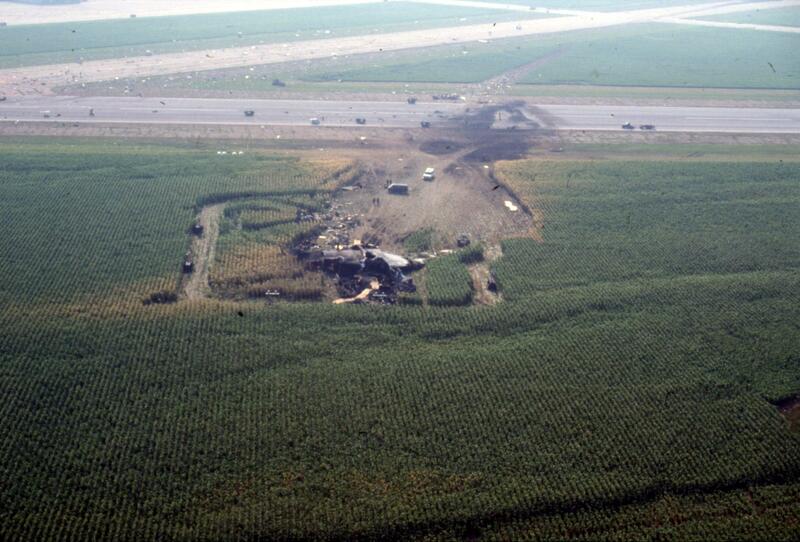 Twenty-five years ago, on July 19, 1989, high above the cornfields of Iowa, an engine explosion rocked United Airlines Flight 232, crippling the hydraulic system that governed the airliner’s controls. The flight crew was faced with the challenge of trying to land a marginally controllable plane while those on the ground prepared for the worst. United 232 was flying from Denver’s Stapleton International Airport to Chicago O’Hare, after which it would continue on to Philadelphia. A McDonnell Douglas DC-10-10 registered N1819U which had been delivered to United in late 1973 was operating the flight on this day, with Captain Alfred “Al” Haynes, First Officer William Records and Flight Engineer Dudley Dvorak manning the flight deck. On board were 285 passengers, many of whom had taken advantage of United’s “Children’s Day” promotion which allowed children to fly for $.01. There were 52 children on the flight, along with 8 infants. Flight 232 took off from Denver a little after 2:00 PM and climbed to its cruising altitude of 37,000 ft. uneventfully. A little over an hour later, as the plane crossed into Iowa the titanium fan disk in the DC-10’s tail mounted No. 2 engine failed, causing it to disintegrate and spin off. The resulting explosion was so violent that the fan disk and other debris were blown out of the engine housing. The explosion also knocked out one of the aircraft’s three independent hydraulic systems, while shrapnel from the damaged engines penetrated the right horizontal stabilizer severing lines for the other two remaining hydraulic systems. Hydraulic fluid from all three lines drained away quickly. In the flight deck, the crew heard a loud bang followed by the aircraft shaking and entering into a climb as the autopilot disengaged. Warning lights illuminated alerting the crew to the failure of engine No. 2. First Officer Records – who was the Pilot in Command on this leg of the flight – took control of the yoke as Dvorak radioed the Minneapolis Air Route Traffic Control Center to inform the they had lost the No. 2 engine. Haynes had Dvorak call out the engine shutdown checklist. The first item on the checklist was to close the throttle to bring the engine to idle, but the throttle would not move. Haynes tried to cut the fuel flow to the engine next, but that lever was also stuck in place. Fuel flow was eventually shut off by hitting the firewall switch. At this point the aircraft’s nose had pitched down and it began rolling to the right. “I can’t control the airplane” Records said, and Haynes was astonished to see Records pulling the yoke hard to the left and all the way back, something that would never be done on a DC-10 in flight. Haynes grabbed his control yoke and also began to pull to the left but to no avail as the aircraft’s right bank continued to steepen, rolling all the way to a 38 degree angle. The plane was inching ever closer to rolling over and entering an unrecoverable dive. As a last resort Haynes closed the left throttle while pushing the right throttle to maximum power. This use of differential thrust caused the aircraft to yaw to the left, generating more lift on the right wing which after a few tense seconds began to level off. Scanning his instrument panel, Dvorak was shocked to the hydraulic pressure and quantity indicators reading zero on all three systems. 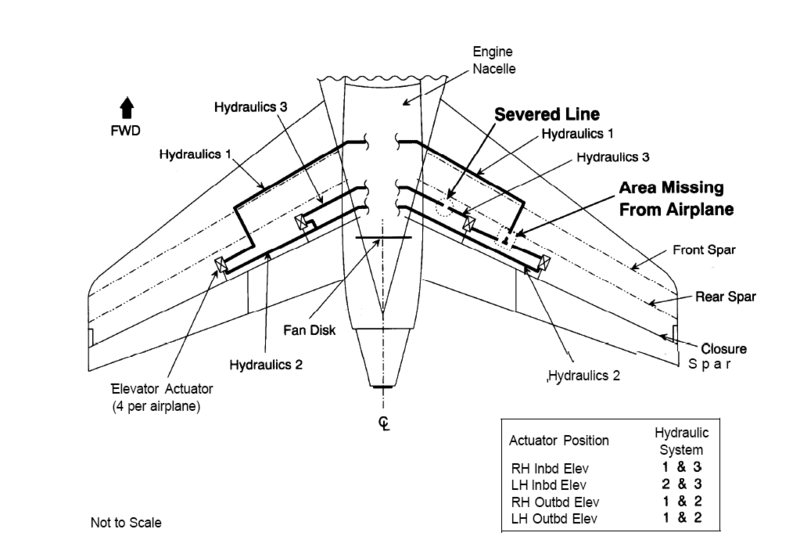 Each of the hydraulic systems on the DC-10 functions independently for purposes of redundancy, each powered by one of the engines of the plane. If one system were to fail there would be two others providing power to the control surfaces of the plane. None of these systems were directly tied to each other but all had lines that shared the same 10 inch route in the tail section, which was badly damaged in the explosion. Losing all three meant the pilots in the flight deck had no use of the ailerons to bank the plane, no elevators to control pitch and no rudder control for turns. They could not activate the flaps or slats to slow the plane down for landing, as well as no way to activate the wing spoilers to reduce speed and slow down on the ground, assuming they managed to land the plane. And once on the ground there were no brakes to stop the aircraft. The chances of such a scenario happening were calculated at 1 billion to 1, so there was no training or procedure to follow to address such an emergency. To complicate matters even further, the plane had begun a series of up and down oscillations known as a phugoid. The aircraft would descend hundreds of feet gaining speed and creating lift in the wings which would then pitch the noise up causing the aircraft to climb again until its speed slowed and then back down it went. The oscillations occurred every minute and each time the plane ended up at a lower altitude. All the while the damage caused to the tail kept forcing the aircraft to bank right leading into a slowly descending spiral. The only way the crew could come close to controlling this was by using the thrust in the two remaining engines, first to keep the plane upright and then making adjustments to counteract the phugoid: increase thrust when the noise pitched down to gain speed and create lift; when the nose lifted up reduce thrust to slow down and bring the nose level. The airplane was coming back down to Earth no matter what, Haynes and his crew needed to find a way to coax back down to a safe landing, either in an open field or at the nearest airport they could find. Jan Brown was the lead flight attendant on Flight 232. When the engine exploded she initially thought a bomb had gone off in the cabin and went to the floor to shield against a rapid decompression. Shortly afterward the chime rang at her station. It was Dvorak asking her to come up to the flight deck. When she arrived and the door was opened she was taken aback by what she saw: both Haynes and Records struggling with the controls, while Dvorak was on the radio with United’s maintenance center in San Francisco to get help solving their problem. “We’ve lost all hydraulics” Haynes said over his shoulder. Brown headed back into the cabin to brief the other flight attendants, opting to tell them individually instead of calling them all together so as to not cause panic amongst the already alarmed passengers. Dennis Fitch, a DC-10 training check airman (TCA) at United, was seated in first class on his way home to Chicago for the weekend. He noticed a look of concern on the face of one of the flight attendants and attempted to reassure her that the plane could fly on two engines. The flight attendant then told Fitch that the captain had said all hydraulics were lost. A photo of United 232 taken just prior to the crash. Note the damaged right horizontal stabilizer. “That’s impossible,” Fitch replied, “it can’t happen.” Fitch then offered to go up to flight deck to assist in any way he could, an offer that Haynes took up right away. He first had Fitch go back in the cabin and look out the window to see if their control inputs were moving any of control surfaces on the wings. When he returned Fitch indicated that both ailerons were slightly raised but not really moving. Fitch noticed that both pilots were struggling with keeping their hands on the yokes while trying to manipulate the throttles. Since the lever for the No. 2 engine was jammed in place, Haynes had to reach over to control the lever for No.1 while Records did the same for No. 3. 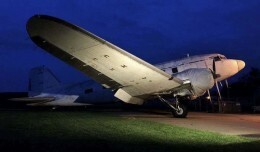 Fitch offered to help with the throttle inputs, freeing the pilots to continue trying to stabilize the plane while communicating with Air Traffic Control. 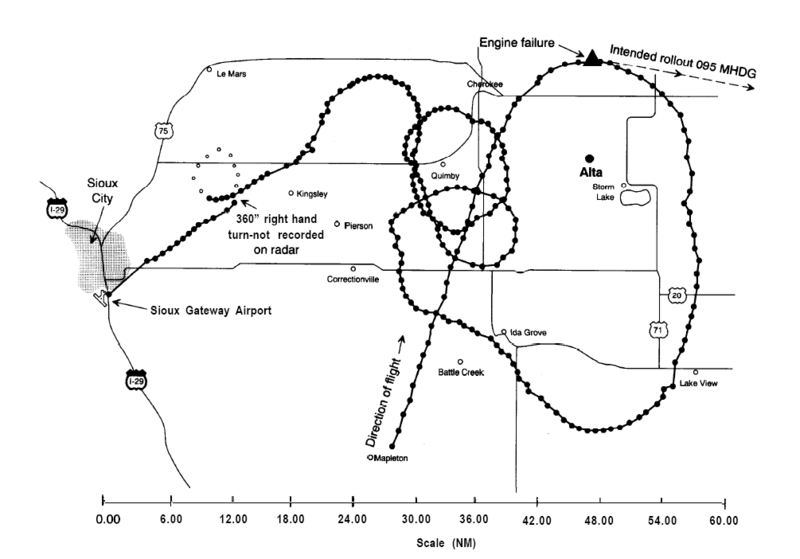 Having already declared an emergency to Minneapolis Center, United 232 was directed to the nearest suitable airport for an emergency landing, Sioux City’s Gateway Airport located 70 miles away. Since the plane could only make right turns, the crew began a series of long 360 degree turns in an effort to line up for an approach to the airport. Meanwhile on the ground in Sioux City, it quickly became apparent that the inbound DC-10 was in serious trouble. 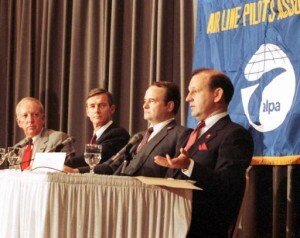 The flight crew’s struggle for control had the unintended benefit of allowing additional time for Sioux City to assemble the necessary emergency resources. Given the aircraft’s dire situation coupled with Haynes’ uncertainty about reaching the airport, the alert level was raised from Alert 2 (aircraft emergency) to Alert 3 (aircraft crash) about 15 minutes prior to United 232 touching down. This enabled additional fire departments time to get into position to respond and alerted hospitals of an impending accident. Also of help was that the 185th Air Refueling Wing of the Iowa National Guard was based at Sioux City and this was the one day out of the month where all members were at the airport and available to help the rescue effort. Back onboard, the crew began preparing for landing; Haynes briefed the passengers on the PA system about the impending emergency landing in Sioux City, instructing passengers to brace for impact on his signal. Afterward, Jan Brown gave the detailed safety briefing. Noticing that there were several passengers holding children on their laps, Brown instructed them to place their children on the floor while holding them down, in order for them to be better protected from impact. While this is standard procedure for emergency landings, in that moment Brown found those instructions to be some of the most ludicrous words she had ever spoken. Next the flight crew debated whether or not to lower the landing gear and decided the gear should be down to absorb the shock of what would be a very hard landing. The next decision to make was how to do it; with no hydraulics the crew could lower the gear lever and just let the wheels drop down and lock into place. Fitch suggest another option, in which a handle underneath the flight deck floor would be used to manually lower the gear. 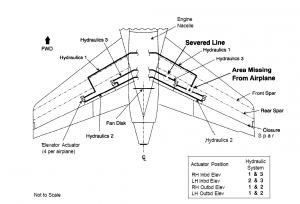 This method would unlock the outboard ailerons and perhaps any hydraulic fluid trapped in those ailerons could be used to control the aircraft. While the crew succusefully lowered the gear using the manual method, they still were not able to regain any aileron control. With the gear down and Fitch manning the throttles, the aircraft was making what resembled a stable approach although at a speed of 240 knots, far beyond the DC-10 limits of 140 knots. 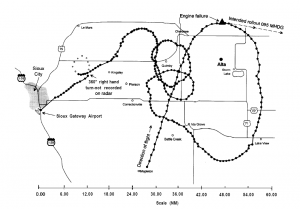 Sioux City Tower had tried to direct United 232 to Runway 31, the plane’s lack to turn control plus rapid sink rate meant the pilots would have to opt for Runway 22, a 6,600 ft. 1940’s-era runway that had long been closed. 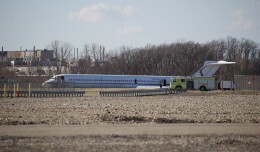 Rescue crews which had lined up on Runway 22, had to scurry to move out of the way. Despite being a shorter runway, 22 did have the benefit of having a cornfield off the end of it in case of an overrun, as opposed to the Missouri River that was off the end of 31. 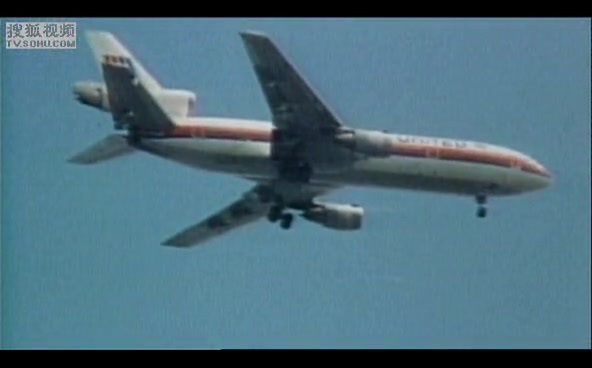 At 400 ft., seconds prior to touchdown, Haynes asked Fitch to reduce power as he was concerned about the tires exploding on touchdown. Fitch was planning to close the throttles just prior to touchdown and then noticed the aircraft’s extremely high sink rate of 1,800 ft. per minute. At that moment, the plane entered a downward phugoid. Fitch pushed both throttle levers as far as they would and the left engine spooled up to 96 percent but the right one lagged behind, only spooling up to 66 percent. With the plane only 100 ft. off the ground the right wing dipped to 20 degrees causing the wingtip to strike the ground at the same time as the right main gear and nose gear. The impact sheared the right wing off, rupturing the fuel tanks and igniting a large fireball. The plane then rolled over and skidded on its side, snapping the tail off and veering off to the right as the tail section skidded down the runway. With weight of the tail now gone and the plane’s high rate of speed creating lift in the left wing, the back end of the fuselage lifted up, momentarily putting the plane on its nose while spinning around. 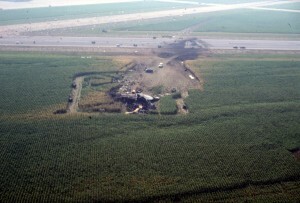 The cockpit section snapped off as what was left of the plane rolled over onto its back and continued sliding to a stop in an adjacent cornfield, engulfed in flames. The sheer ferocity of the crash made it hard to believe there would be any survivors. But as rescue crews approached the wreckage they were astonished to see people emerging from the smoke. In one instance, a passenger laying in the grass got up, found his suitcase, grabbed it and walked away. Several other passengers were found wandering in the cornfields. Brown later recounted the crash, describing the “incredible force” of the impact and tumbling. She had briefly been covered in flames as the flash fire raced through the cabin and was knocked unconscious, coming to and finding herself hanging upside down. Despite her injuries she quickly got down and helped passengers escape before the smoke became too intense. 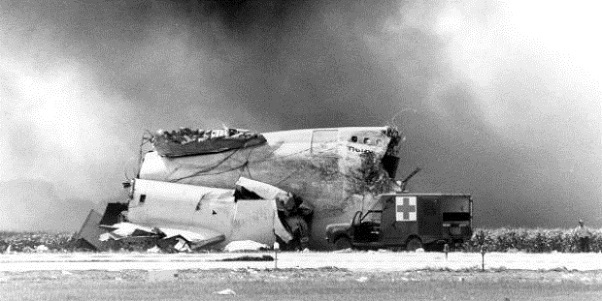 Of the 296 people on board-including crew- 184 survived the crash, an incredible number given the fact that up to that point an airliner with a complete hydraulic failure had never come close to a safe landing. 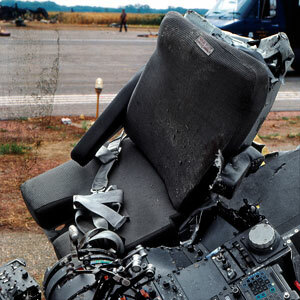 The four pilots survived as well, found alive, though severely injured, in the crushed cockpit section about a half hour after the crash. Nearly three months after the accident, Janice Sorenson, a farmer in Alta, IA, was harvesting her corn crop when the combine she was operating met some resistance. When she went to investigate she found a large portion of the damaged General Electric fan disk partially buried in the ground. Other pieces of the fan disk were later found on the Sorenson farm. Investigation into the engine failure revealed that a manufacturing defect during the engine’s production in 1971 caused a microscopic crack in the fan disk. The crack went undetected during ultrasound tests conducted by General Electric and in subsequent maintenance inspections conducted by United. In the months that followed the FAA created the Titanium Rotating Components Review Team that would work to improve the manufacturing processes and inspection of spinning parts on jet engines. To prevent the complete loss of hydraulic fluid, McDonnell Douglas installed hydraulic fuses on the DC-10 that would isolate puncture areas retaining the necessary fluid to maintain controlled flight. In a scenario where all three lines were damaged, some components like the rudder would be lost, but the aircraft would still have enough controllability to make a safe landing. The FAA explored the idea of training DC-10 pilots on the total loss of hydraulic systems, loading the actual flight data from 232 into a simulator to see if pilots could land the aircraft using differential thrust. In dozens of tries, not one pilot was able to safely land the aircraft under the same circumstances. The outcomes of the simulated scenarios varied so widely that the FAA later abandoned the idea. Including Brown, seven of the eight flight attendants on 232 survived the crash and eventually returned to work. In the moments following the accident, Brown was confronted by a mother of one of the lap children. She had placed her 22-month-old boy on the floor and held on to him, just as Brown had instructed. Tragically after the impact she lost her grip and could not find him in the wreckage. He did not survive. The mother’s anguish would haunt the veteran flight attendant in the years that followed, motivating her to lobby Congress and the FAA to mandate the use of child safety seats on all flights, instead of allowing children under 2 years of age to be carried on a passenger’s lap. Each of the pilots returned to work within a few months after recovering from their injuries. Al Haynes continued to fly the DC-10 until his retirement in 1991. Since his retirement he has become a public speaker, giving presentations on the accident and the coordinated response efforts, something he says has helped him come to terms with the event. Dennis Fitch went back to his job as a TCA almost a year later. He passed away from brain cancer in 2012. In every aircraft accident there is a chain of events, known as the “accident chain”. Like falling dominoes, the chain starts with one event, decision or action, which leads to the next ultimately leading to the occurence. In the case of United 232 that chain started in the early 1970’s during the manufacturing process of the engine fan disk, through the subsequent maintenance inspections, and finally the component failure which lead to the uncontained explosion. However, a separate chain of events and circumstances, some of which were quite fortuitous, lead to the high survival rate. This chain starts with the flight crew’s use of Crew Resource Management, or CRM. 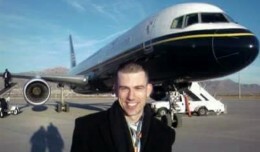 Haynes credits the use of CRM as being one of the main factors that enabled the crew to guide the stricken DC-10 back to an airport. In a speech given at NASA’s Ames Research Center in 1991, Haynes said “Up until 1980, we kind of worked on the concept that the captain was the authority on the aircraft. What he said, goes. And we lost a few airplanes because of that. Sometimes the captain isn’t as smart as we thought he was. And we would listen to him, and do what he said, and we wouldn’t know what he’s talking about. And we had 103 years of flying experience there in the cockpit, trying to get that airplane on the ground, not one minute of which we had actually practiced, any one of us. So why would I know more about getting that airplane on the ground under those conditions than the other three. So if I hadn’t used [CRM], if we had not let everybody put their input in, it’s a cinch we wouldn’t have made it.” Dennis Fitch’s expertise and willingness to help with whatever he could also contributed to the crew’s success. The time of day was another factor that worked in the crew’s favor in a couple of different ways. The accident occurred during daylight hours, making it easier for the crew to find Sioux City which was in unfamiliar territory for them. Also the aircraft’s arrival coincided with the shift change at the local hospitals, so there was extra medical staff on hand to treat the injured. 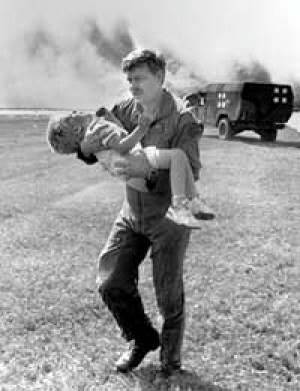 Another instance of good timing was that the Iowa Air National Guard was on duty that day, providing 285 trained personnel to assist with triage and evacuation of the injured. The weather played an important factor as well. Thunderstorms and unstable air are common in the midwest during the summer. On this day the skies were clear and there was no turbulence. Any sort of rough air would have severely impacted the ability to keep the plane upright. 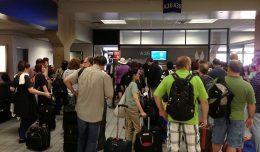 Finally the preparedness of Sioux City Gateway Airport to handle such an emergency was key. Airport Rescue and Firefighting Capability is based on the size of the aircraft that regularly use that airport. Sioux City is classified as an Index B airport, with sufficient equipment and rescue personnel to handle an aircraft the size of a 737. Widebody aircraft like the DC-10 typically utilize airports classified as Index D, which have far more in the way of on-site resources for an aircraft of that size. However two years prior to the accident, Sioux City had conducted a disaster preparedness drill at the airport which had an eerily similar scenario: A widebody jet crash lands on the closed Runway with 150 survivors on hand. Under this scenario the airport would employ mutual aid, calling in local fire departments, ambulances and police to assist with the rescue effort. This drill was in addition to the annual “tabletop” training conducted at all airports, in which airport personnel talk through response procedures in the case of a major emergency. This Saturday marks the 25th anniversary of this of this tragic, yet miraculous, event. The Mid-America Museum of Aviation and Transportation in Sioux City will be hosting a series of events all weekend, honoring the first responders and survivors, commemorating those who lost their lives and reflecting on the event and the lessons learned from it. Excellent book just out on this crash called “Flight 232”, Laurence Gonzales Great read. Great article. The flight crew were heroes – it’s amazing anyone survived, and it was thanks to their efforts in an impossible situation. It’s too bad this anniversary was overshadowed by the tragedy only two days ago befalling Malaysia Airlines Flight 17 (as well as the TWA Flight 800 anniversary). I remember hearing about this crash when I was a kid. I can’t believe it’s been 25 years. These pilots (and co pilots) are frequently ex-military fliers. These guys flew under VERY adverse conditions, many times fighting their craft to get home after damaged in combat. They’re able to think clearly and calmly in these situations, instead of panicking. I’m not sure if the younger airline pilots can rise to the occasion. There are other examples (and also in the same TV series) of ex-military fliers having had made terrible mistakes due to their background in military aviation, which lead to fatal consequences. What could use “rising to the occasion” is what type of people are allowed to sit and steer the plane. A very large and disturbing percentage of past, current and future commercial pilots are -simply- not capable of dealing with an emergency situation, of any degree, for whatever reason. Once that we’re able to remove this kind of imminent danger, flying would get a lot safer – possibly much more so than what automation has done for commercial flying.